ZWO ASI385MC-C Cooled is the successor to ASI185MC-Cooled camera! Sony Semiconductor Solutions Corporation has developed the CMOS image sensor “IMX385LQR” for industrial applications. This new image sensor realizes high sensitivity approximately twice that of the existing product (IMX185LQJ). The IMX385LQR pursues picture quality at low illuminance most needed by cameras for industrial applications and mounts pixels with a sensitivity of 2350 mV, which is the highest sensitivity among Sony image sensors for industrial applications. In addition, SNR1s of 0.13 lx, which is the highest performance among Sony Full HD-compatible image sensors for industrial applications, is achieved by mounting an internal programmable gain amplifier and high conversion gain pixels. 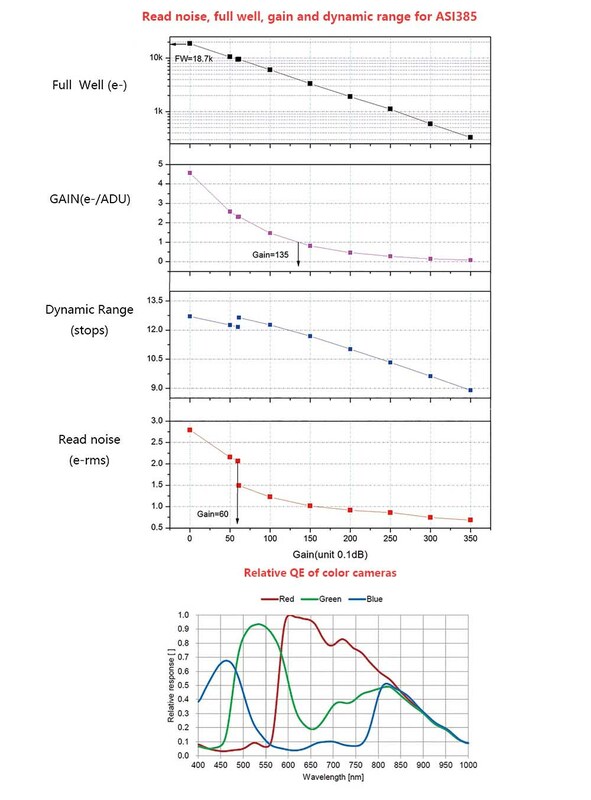 Superior performance as an image sensor for industrial applications is further achieved by combining HDR (High Dynamic Range) technology with technology that improves sensitivity in the near-infrared light region.